More than a billion people throughout the world do not have electricity in their homes. Billions more get their electricity from non-renewable resources that threaten the world environment. There is an urgent need to bring power to all people without contributing putting the planet at risk. 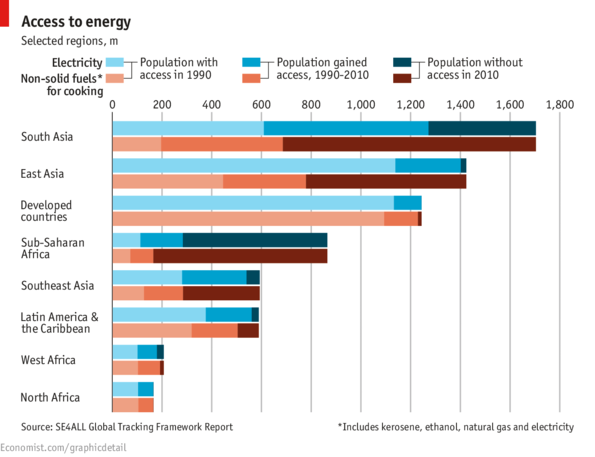 About 20% of the world does not have access to electricity. It’s difficult for those who have always lived with electricity to imagine life without it. But this global view illustrates a very harsh reality for about 1.2 billion people, some 20% of the world: the areas that are dark, primarily still emerging economies, do not have access to electricity. That leads to a global dilemma: The usual solutions for bringing more electricity to people also bring more damage to our environment. Thus far, to bring electrical power to the people and areas needing it, the primary response has been an explosion in the generation of electricity by coal-burning plants. Although the use of wind- and solar-generated power systems has increased as a solution as well, coal-burning plants are being planned and are under construction at a rapid rate. The problem is growing faster than the solution. Working through the UN, most of the nations of the world set 2030 as the year that the entire world would have electricity. But that’s now considered unlikely. A new report prepared by International Energy Agency and the World Bank, cites statistics that indicate that goal will not be met. The key reason is that the rate of growth in electrification has been slower than population growth: access to electricity grew at about 1.2 percent per year between 1990 and 2010, while the global population grew at 1.3 percent per year. The report noted that “The investments required to achieve the three objectives are tentatively estimated to be at least $600–800 billion per year over and above existing levels, entailing a doubling or tripling of financial flows over current levels.” Only about one-fifth of that price tag is for expanding energy access to poorer countries — the rest is for cleaning up the energy supply. Progress on the latter has also been slow. The report notes that the world’s share of renewable energy has ticked up only slightly since 1990, from 16.6 percent to 18 percent in 2010. The combination of vast numbers of people needing electricity and plants that rely on burning fossil fuels to produce it is creating a crisis that incurs enormous hidden costs. The result: solutions to address the dilemma are urgently needed. When people think of the cost of using fossil fuels to produce electricity, they usually consider such issues as land use, waste management, and water and air pollution caused by the recovery of these fuels from the earth. But there are also severe health effects caused by burning fossil fuels. According to reports issued by the World Health Organization in 2008, coal particulates pollution are estimated to shorten approximately 1,000,000 lives annually worldwide – and that does not include the health consequences from burning oil. In fact, a major EU funded research study known as Externalities of Energy, undertaken over the period of 1995 to 2005, found that the cost of producing electricity from coal would double over its present value, when factoring-in external costs such as damage to the environment and to human health. There is no single solution. There are several. There is neither a single nor a simple solution to the dual dilemma of bringing electricity to all people in the world as soon as possible without causing further negative impact to the environment. Existing solutions, including coal-burning and nuclear power plants are likely to be part of the solution for many decades. 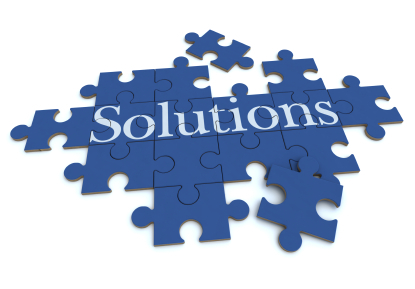 But there will be increasing use of other solutions as well. For example, electricity generated from wind turbines didn’t become a serious alternative until the energy crisis in the 1970s; today wind generates about three percent of all electricity in the US. Similarly, the use of solar power has also grown; for example, residential installations of solar energy systems grew 53 percent in Q1 2013 over the same quarter in the previous year. For the past several years, research and development efforts and initial deployments have shown that water currents can also be a viable source to generate electricity. Want to know how? Click here.